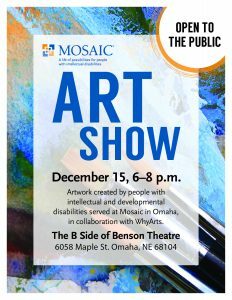 MOSAIC, a faith-based organization serving people with intellectual disabilities and a Benson Theatre community partner, will host an art show Friday, Dec. 15, from 6:00 to 8:00pm at B Side, 6058 Maple Street. The event is free and open to the public. 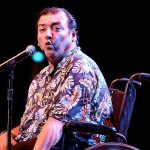 All of the work in the show was created by people with intellectual and developmental disabilities with the help of Tom Flott and WhyArts artist Richard Chung. 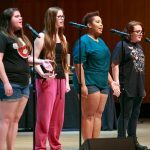 WhyArts, a nonprofit dedicated to providing Omaha’s underserved populations with access to inclusive quality arts programming, is a Benson Theatre community partner. Mosaic supports more than 3,700 clients and employs more than 3,300 individuals through 36 agencies in 10 states, including Nebraska and Iowa. For more information about MOSAIC, visit www.mosaicinfo.org. For more information about WhyArts, visit www.whyartsinc.org.